Buy Vegetables and Fruit Chopper with 55% whopping Discount with Free Chop Blade and Cleaning tool too. 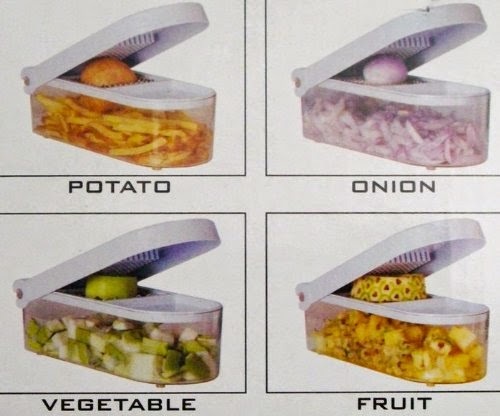 Save your time and injuries during Fruit and vegetable cutting. Regular Buying Price of this Ganesh Vegetable and Fruit Chopper is 610 Rs on Amazon, but you are saving 335 Rs in this Deal from Amazon offer, Buy this Vegetable and Fruit cutter in just 275 Rs. You don't need to enter any Discount coupon code differently, just go to the below amazon offer page and Press Add to Cart, now proceed with your details. You will automatically avail 55% Discount on this Amazing Vegetables and Fruit Chopper. Hope you like this Deal, Never miss any Discount offer or Free Deals, Subscribe All India Coupons below via Email.